This mod allows you to recruit all four companions (or henchmen) at the same time, for a party of 6. All versions of this mod require a new playthrough. This does not work well if at all with controllers, since the UI cuts off too much. If using the Epic Encounters with 6 man party version, also download the STEAM SUPPLEMENT from the Epic Encounters nexus page and place those in your game data folder. The steam supplement is required even for the GOG version. DELETE any other version of Epic Encounters in your game folder or documents folder. Unsubscribe from the steam version of Epic Encounters. Don't forget to activate whichever mod you're using in the mod menu of the game! Only have one mod active at once. Start a new game to get changes to work. You may see an error about dependencies (e.g., "The files of 6 man party and/or it´s dependencies are invalid..."). This can be ignored and you can play multiplayer (though I believe both people need the mod installed). Endorse Epic Encounters Nexus Page! Remember, do NOT download the Epic Encounters version from the nexus or steam and try and get the plain 6 man party version to work with that or anything. Download the Epic Encounters with 6 man party from this page, and the STEAM SUPPLEMENT from the official epic encounters nexus page. Those are the only files you want to have EE with 6 man work properly. 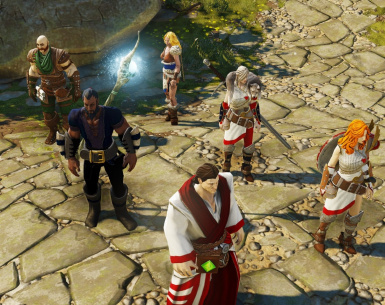 6 Man Party with Moderate Difficulty Increase and quality of life Features (Fast Run Speed, customizable companions, and endless healing potions for out of combat healing). This increases enemy stats, though not really quite enough to make a genuine challenge with 6 characters, to be honest. Epic Encounters with 6 Man Party Story file -- A merged file to play Epic Encounters with a 6 character party. I've placed a cheat hearthstone (green orb) at the beginning of the beach where you first start. Pick it up and place it in your hotbar and click on it and you will teleport to a character development area, in case you want to cheat and level up to skip ahead. There's a button on the wall behind the giant ooze merchant that will level you up, and you can gear up as well, and then you can head up the stairs to teleport where you want (mouse over the gravestones to see locations). If you don't want to cheat, then don't pick up the hearthstone, simple as that. I don't recommend skipping too far into the game, or you might yourself a bit disoriented or overwhelmed with the changes and the challenge, but if you want to skip the first part of Cyseal or skip to Silverglen, that's an okayish place to start. For a more balanced experience when skipping ahead, avoid decking yourself out entirely in epics or the perfect items for each character, though a few levels in all of that will be obsolete anyway, so it's not a huge deal. You can use this mod just for the cheat if you want, and stick with a 4 character party, though double lone wolf will allow a 4 character party, so you'll just have to manually kick companions out if you want a "balanced experience" (though double lone wolf is pretty damn hard, be warned). I HIGHLY recommend playing with Epic Encounters. Sandpie and Elric have made a masterpiece. For many people the extra challenge will make a 6 man party not THAT overpowered (on Tactician mode at least).